If you have not read the 1st and 2nd part of our blog, we highly recommend reading them. Read the 1st part here –> . This is what a good 4K HDR projection is all about in my mind – expanded colors, wide dynamic range, and incredible detail. I am happy to report that none of these projectors disappointed when looking at good, 4K HDR Blu-ray discs. It is worth mentioning that even though the 4K disc may be labeled 4K and have HDR and expanded color, not all 4K discs are mastered from 4K masters. They can still be very good, but when it comes to comparing projectors and getting the very best images, a disc that is mastered in 4K can make a huge difference. The Greatest Showman was mastered in 4K HDR and is spectacular in its rich color, fine detail, and some of the best dynamics for HDR we have seen yet. Some of these images will appear a little dark as we tried to expose for the highlights and our still camera is not fully HDR (16 stops) (and even if it were – your monitor is probably not still-image-HDR capable as those standards have not been set yet. It is my understanding that they are working on it). Nevertheless, some of the differences will be very apparent as far as comparing each one next to its competitor all with the same image capture limitations. Only in person can you really see the range of tones and detail from deep shadows to brilliant highlights and everything in between that this 4K disc can deliver. Even though this scene cannot be fully captured off the screen due to limitations in still image cameras, imagecompression for the internet and viewing monitor limitations, it is spectacular in terms of deep shadow low light detail and fine detail in the super bright spotlight on Hugh’s white shirt all at the same time. (at least when viewing live from the projectors, a lot is lost in compression and SDR). We were especially impressed with how the JVC handled HDR. 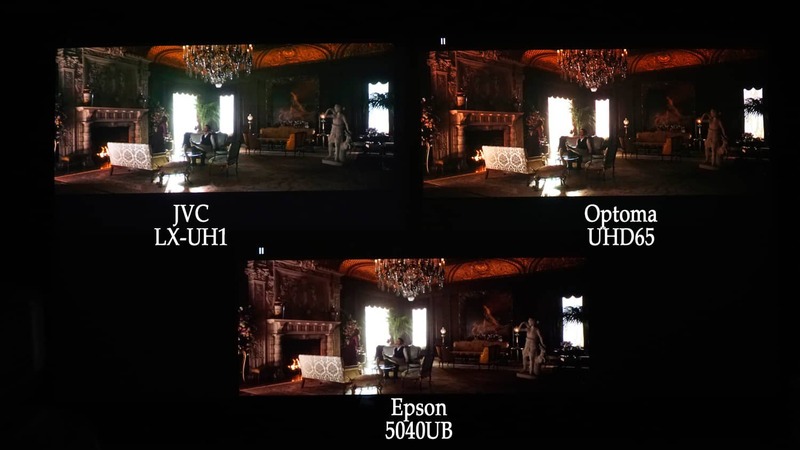 Even though it is rated less bright than the Optoma and Epson, it held its own and even looked best on some scenes when it comes to dynamic range and HDR color. It was interesting to see how each projector handled different, and somewhat challenging, scenes. Each one seem to beat the other on certain scenes as these next few slides should show. 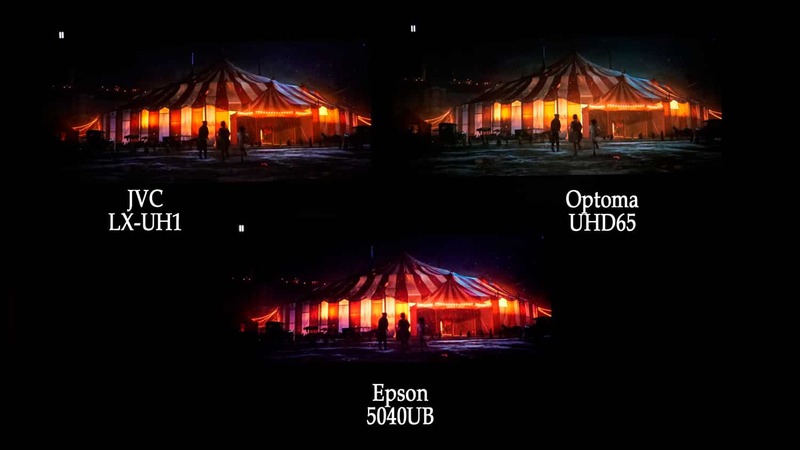 In this HDR scene (again from “The Greatest Showman” we really like the color and brightness of the Epson. If you look closely however, you will see some advantages of some characteristics of HDR in each projector. Although to capture exactly what the eye sees and to reflect that in a still image does not give it justice, in this detailed scene, with an abundance of very fine 4K detail in the chandelier, the back of the sofa and fireplace – the eye is quickly drawn to the Optoma. Another great scene which shows the key advantages to 4K HDR in projectors. In this scene, the JVC really delivered excellent HDR with a great balance of color, fine detail and wide dynamic range from the detail in the dark bark of the trees to the sunlight hitting the top stair. Simply impressive. We mention again, the reason some of these images look dark is because we exposed to capture the highlights without blowing out all the detail. In person, the range of tones and color is almost breathtaking and is what 4K HDR is all about. These last couple of shots focus more on color and detail. While all of these projectors did a commendable job in this category of projectors under $3,000, each projector made its case for why someone would choose it over its competition. All of these projectors were similar, but had slightly different tone mapping for HDR skin tones in each projector. One could certainly argue why he or she thought one was better than the other. Compare not only skin tones but fine detail and colors in the flowers. Although we could not capture the full dynamic range in this still, due to still camera limitations, the detail, however, in the bead work on this gown is spectacular. Here you can see the three levels of 4K reproduction if you look at the beads. (Right click or click on image to see higher-res picture). Each projector has its advantages and down sides. In this group, you really could not go wrong. 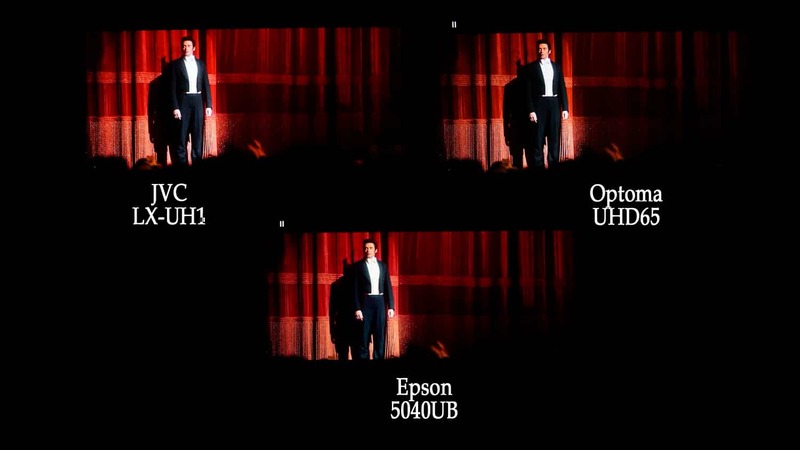 If each projector is set up properly and the settings are optimized for the best and brightest HDR mode, it is a tough choice. Here are a few guidelines to assist in you personal preference. While some have said they thought the JVC LX-UH1 (B for Black and W for white) was overpriced for a .47″ 4K DLP projector, if you consider that it has a 1.6X zoom (most have a 1.3X zoom) and a fair amount of both horizontal and vertical lens shift along with it being one of the very few 4K DLP (maybe the only) projectors with a dynamic iris, it is still a very good value. The JVC is also, by far and away, the smallest and most compact of the projectors in this group – a mere 10.2 ibs. it certainly could be portable if you wanted a projector you could move around. It is also one of the first 4K projectors to feature the new Hybrid-Log gamma. Hybrid-Log gamma is basically a standard for HDR for over the air, satellite, and cable TV. Although not fully implemented yet, it is part of the ATSC 3.0 standard for possible future use in the US. If you are a serious online gamer or fan of 3D Blu-rays, this may not be the best projector for you. Also, if you would be sitting close to the projector you may want to turn off the iris as it is noticeable if you are close to it. The JVC typically sells for $2,499. 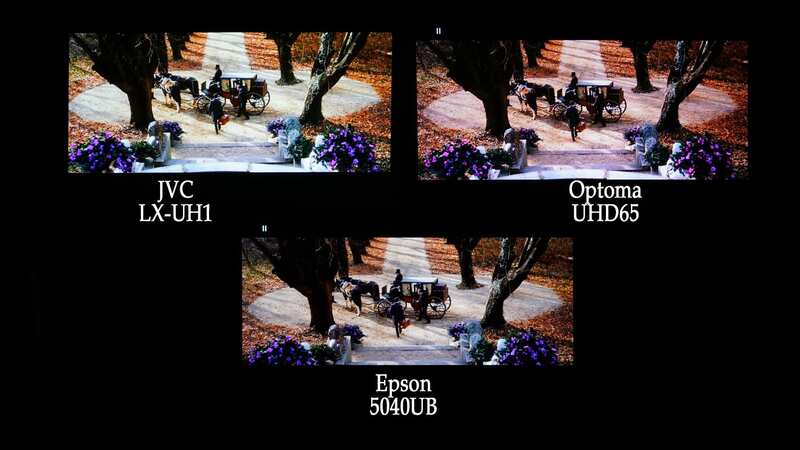 The Epsons are definitely the most feature-rich of the group with their motorized lens with memory, 3D capability, wide color gamut, good blacks, usable high brightness mode, and even a gaming mode for fast response. The 5040UB is just the projector in a white color. It may be your best choice if you want the Epson and do not need a ceiling mount, spare lamp, and additional 1 year of warranty. The 6040UB comes in black and is a great value if you want a spare lamp and the extra year of warranty. Even if you do not need the mount, with the 6040UB, the spare lamp and extra warranty pretty much cover the cost differences. 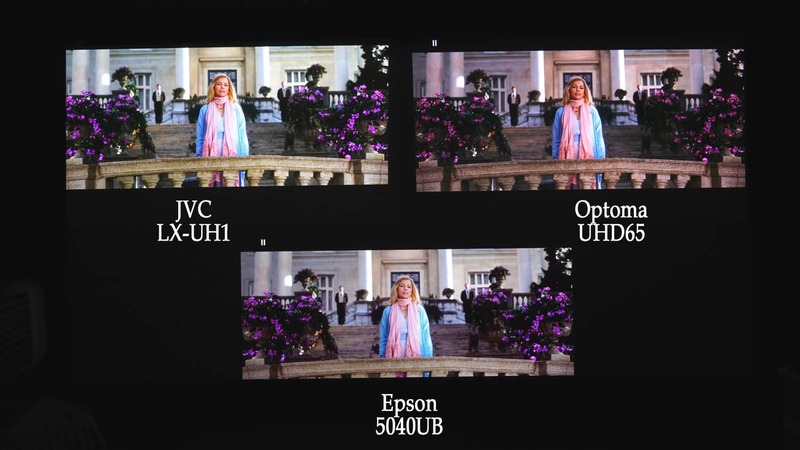 Epson has chosen to give up a lot of their extra brightness in the “Cinema” and “Digital Cinema” modes in order to achieve a wider color gamut. Although it does not approach what a laser projector can achieve, it is about as good as we have seen when it comes to wide color gamut in a lamp-based projector. The only real downside, beside the lower brightness in best color modes, is the 4K Enhancement. 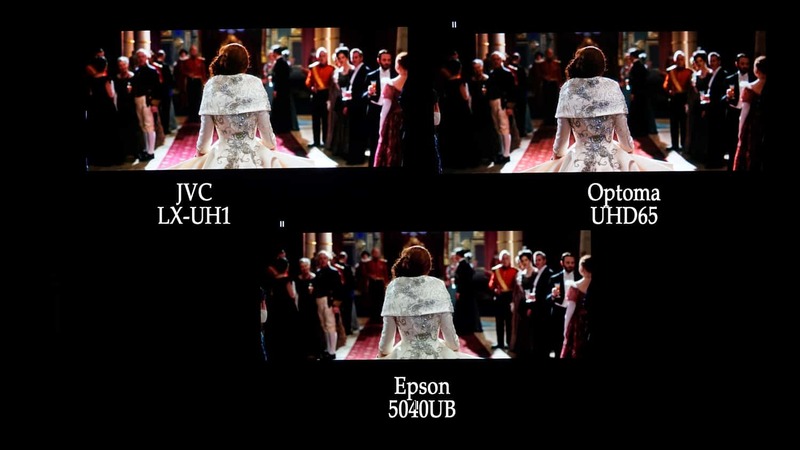 While it is certainly better than HD resolution and comes very close to the JVC it is simply not in the same league when it comes to fine detail of the UHD65. The 5040UB typically sells for $2,699. The Optoma continues to amaze us. When it comes to 4K detail and sharpness, it is in a class by itself in the projectors under $3,000 range. It has good color, excellent contrast and does a great job with HDR content when set up properly. It does require a few tweaks out of the box, but when done properly, it can deliver a great image. You may want to make sure that whoever you buy yours from is familiar with and can assist you in getting the best images. Surprisingly, the UHD65 is not quite as bright as the JVC, but for most screens up to about 110″ it has plenty of brightness. The longest lamp life of the bunch (up to 15,000 hours) and full 3 year warranty make this a great choice. Like the JVC, this would not be a good choice if you want 3D, require lens memory, or need a very fast response time for gaming. If you are mainly interested in a very detailed and sharp image with good color and contrast on both HD and 4K, then this could be your best option for under $3,000. the UHD65 typically sells for $2,299. So now you’ve seen and heard what we’ve discovered and seen, what do you think based on the images given? 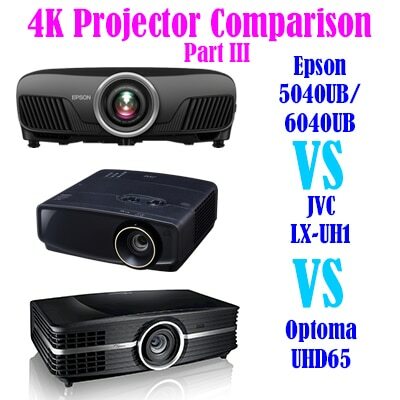 This entry was posted in AV Solutions, Home Theater and tagged 4k, 4K Projector Comparison, 4K Projector review, 5040UB, 6040ub, detail, epson 5040ub, epson 6040ub, epson home cinema, HDR, home cinema 5040ub, home cinema 6040ub, jvc lx-uh1, lx-uh1, Optoma UHD65, projector comparison, REC790, sharpness, UHD65.